Chromaesthesia is a condition in which one’s sensory perceptions are involuntarily unified, specifically in seeing colours and patterns based on music. By incorporating visual arts into a music festival setting, we seek to enhance the overall sensory experience, interlocking the relationship between sight and sound. In an attempt to unify these senses, participants have been strategically selected, as each individual artist contributes a powerful visual experience that complements the overall psychedelic landscape that is the Distorsion Psych Fest. Alexandra Mackenzie, also known for her music under the moniker Petra Glynt, is a multidisciplinary artist living in Montreal. Born in Ottawa, she studied at the Ontario College of Art and Design University in Toronto, graduating with her Bachelor of Fine Art in May 2011 with a major in printmaking. Following her operatic voice background, she began playing drums in bands in the mid-2000s which nurtured her love for DIY. While in school, she started screen-printing band merchandise and posters and delved into fine art drawing. More recently, she has introduced painting to her practice. 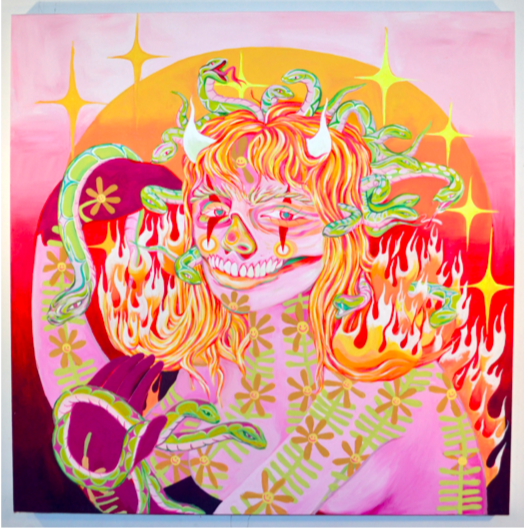 Since graduating from university, Mackenzie has had three solo exhibitions and a number of notable group exhibitions, including The Drake Hotel’s Dream Catchers in Toronto, Grimes and Friends at Audio Visual Arts Gallery in NYC, and When The Institute Fell Over in Cambridge, Ontario. Her latest work aims to bring an extra layer of complexity to her songwriting practice through drawings, illustrations, paintings, and video. Born in 1976, Benoît Erwann Boucherot lives and works in Paris and Montreal. After studying audiovisual arts in France, he opened his first photographic painting studio in 1999 in Paris and began exhibiting in 2001. For over 10 years, he travelled with his Leica cameras to India, Southeast Asia, Europe and the United States. In 2013, after having lived in Morocco and Spain, he returned to Paris, stopped taking pictures and began archiving his photographic collection in order to use it as a basis for his future paintings and drawings. He has exhibited in France, the United States, Mexico, Montreal, and will soon be exhibiting in Tangier, Morocco. He is exhibiting at the UNEQ from January to June 2019. He is also a director and head editor of social news and cultural programs for European television channels, as well as a journalism teacher. Originally from Peru, Dyer relocated to Canada to study art for many years, leading him to become one of the leading figures of the North American Visionary Art scene. Dyer’s art reflects his personal quest for elevated consciousness through natural life experiences and introspection. Dyer currently exhibits, performs and teaches his art worldwide. Although experimenting with different styles, mediums, and subjects, all works are united through the underlying theme of spiritual oneness of humanity and beyond. Eric Braun is a multidisciplinary artist based in Montreal. Primarily working with paint, Braun’s surrealist imagery is an exploration of the unconscious state. Taillefer’s work is consonant with early 20th century surrealists such as Max Ernst, Paul Delvaux, and Giorgio de Chirico, sources of influence for the art of Salvador Dali, to which Taillefer's work is often compared. 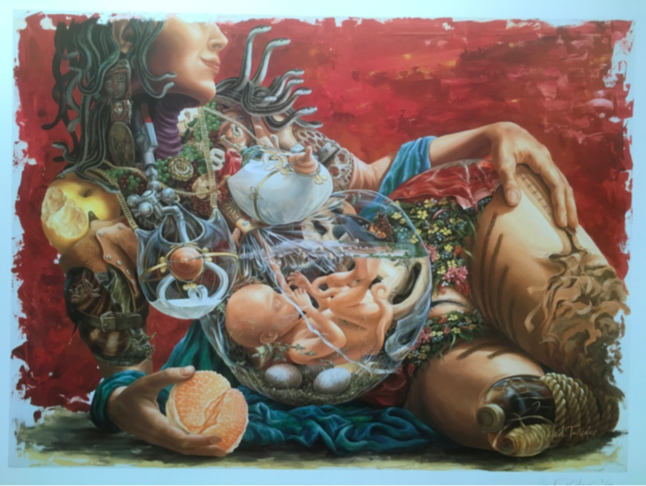 It is an original creative fusion of classical figurative painting, surrealism, contemporary realism, and mythology combined with popular figurative traditions ranging from Victorian Romanticism to science fiction. The characteristic of Taillefer's work which anchors it firmly in a more contemporary context is her depiction of the growing hybridization of technology and humanity, in which she depicts “machinelike” constructions. Taillefer’s approach is to infuse primordial aspects of the human condition into hybridized depictions of humans and animals, and seeks to remind the viewer of the inescapable nature of our being despite our increasing merger with technology. It puts into question notions of spiritual truth and morality within the context of a technological explosion, and asks what becomes of spirituality and humanity in the face of a technological revolution. Julian Baslyk was born and raised in Montreal. He began to create abstract, colorful artworks at a young age. He has studied at numerous institutions including fine arts at Dawson College, painting and drawing at Concordia University and painting at the Montreal Museum of Fine Arts. However, Julian considers himself to be mostly self-taught. He started exhibiting in 2009 where he had his first solo show at Gallery Luz in Montreal which included 9 intaglio monoprints from his Colored Lines series. He became a member of the Montreal Art Center in 2012 where he participated in many group exhibitions and had 2 multidisciplinary solo shows in 2012 and in 2014. These exhibitions featured many paintings, drawings and intaglio prints. Julian has also exhibited in various restaurants, coffee shops and galleries in the Montreal area. Julian has taken part in many group art events and group exhibitions in Montreal over the years. He has had his artwork published 3 times, the first being in the 2013 edition of State of the Art - Artist book, and in 2014 his artworks were published in Hidden Treasure Art Magazine, as well as the July 2018 edition of the magazine from the Montreal gallery called 'Usine106u.' His most recent solo at the Matahari loft show was called 'Harmonious Junctions' and featured 22 paintings and 2 intaglio prints. He has since exhibited in numerous group shows in 2018 at gallery Usine106u. Lauren Pelc-McArthur’s work is a reflection on both technological and organic interconnectivity, and its potential for creation and annihilation. Systems and micro-macro relations populate her work. The paintings provoke optical effects through high-chroma fluorescence, rhythm, and patterns. Visual overload, sci-fi tropes, and psychedelic flotsam and jetsam are all mediated through screen aesthetics in Pelc-McArthur’s paintings to build imagined spaces in states of flux. Pelc-McArthur participated in residencies and exhibitions in the Netherlands, Spain, and the United States. She was nominated for the 2018 RBC Prize for Painting. She is currently in Montreal pursuing an MFA at Concordia University. International artist and emerging photographer Alex Côté creates a contemporary imagery of body, landscape and plastic that unfolds with meditation, contemplation and collective awareness. His work seeks to awaken the primitive soul, the earthly roots and the spiritual connection that bind humans to nature, all the while soliciting the senses of the viewer and creating sacred aesthetics with the performers. Throughout workshops, residencies, festivals and exhibitions, Alex Côté’s creative process has been evolving within the fields of theatre, performance, photography, video, mapping and installation, as well as site-specific and land art. Charline Dally uses video and computer graphics to shake up perceptual habits. Through ambiguous images, paradoxical spatialities or temporal alterations, it maintains a state of heightened attention. The emphasis on experience is a way of making the viewer aware of his or her role as a witness. The "possible fossils" project creates an ambiguity between reality and the virtual, between "objective" reality and perceptual phenomena. The alteration of perception attempts to reveal the prism through which reality is perceived. Montreal’s futuristic tech-digital artist Fvckrender is self-taught. With a defining affinity for sharp architectural geometry, beaming future landscapes and brilliant crystalline arrangements, his visual renderings pay a dark homage to what may eventually reflect our very existence. Mishka Kornai is an artist and filmmaker focused on exploring the infrastructure of human connection. Raised by two computational linguists, he has been interested in art and technology since childhood. His first documentary, Growth, premiered at SXSW in 2015, and his most recent short film, POCKET, was released just two weeks ago to critical acclaim. He co-founded the Los Angeles-based filmmaking collective PICKPOCKET, and his studio THEIA is based in Berlin, Germany. Odette Mattha is a production designer and costume maker based in Los Angeles, California. Originally from Sydney, Australia, she has spent several years travelling North America and Canada working on short films, commercials and music videos. Luke Orlando was born in Toronto, raised in Philadelphia, discovered himself in Montreal, and now makes movies and takes pictures in LA. Overall, Luke’s primary directive is to capture and create work that fosters empathy and catharsis, whether it be through traditional narratives or more abstract spectacle. He is driven by the idea that visual mediums can communicate what cannot be said and in this way dismantle our anxieties to reveal the human being behind the social being. Ottomata is a technological collective that works to break the boundary between imagination and reality. They invite humans to take their place rightful place alongside the digital in situ creations that question the perception of space. Focusing on the digital and interactive arts, their approach extends beyond scenography and living content.